OAK RIDGE, Tenn., March 31, 2016 - A 20-kilowatt wireless charging system demonstrated at Department of Energy's Oak Ridge National Laboratory has achieved 90 percent efficiency and at three times the rate of the plug-in systems commonly used for electric vehicles today. This ability can help accelerate the adoption and convenience of electric vehicles. Industry partners from Toyota, Cisco Systems, Evatran, and Clemson University International Center for Automotive Research contributed to the technology development demonstrated today at ORNL. "We have made tremendous progress from the lab proof-of-concept experiments a few years ago," said Madhu Chinthavali, ORNL Power Electronics Team lead. "We have set a path forward that started with solid engineering, design, scale-up and integration into several Toyota vehicles. We now have a technology that is moving closer to being ready for the market." ORNL's power electronics team achieved this world's first 20-kilowatt wireless charging system for passenger cars by developing a unique architecture that included an ORNL-built inverter, isolation transformer, vehicle-side electronics and coupling technologies in less than three years. For the demonstration, researchers integrated the single-converter system into an electric Toyota RAV4 equipped with an additional 10-kilowatt hour battery. The researchers are already looking ahead to their next target of 50-kilowatt wireless charging, which would match the power levels of commercially available plug-in quick chargers. Providing the same speed with the convenience of wireless charging could increase consumer acceptance of electric vehicles and is considered a key enabler for hands-free, autonomous vehicles. Higher power levels are also essential for powering larger vehicles such as trucks and buses. As the researchers advance their system to higher power levels, one of their chief considerations is safety. "The high-frequency magnetic fields employed in power transfer across a large air gap are focused and shielded," Chinthavali said. "This means that magnetic fringe fields decrease rapidly to levels well below limits set by international standards, including inside the vehicle, to ensure personal safety." Convenience and simplicity are at the heart of the ORNL system, which places a strong emphasis on radio communications in the power regulation feedback channel augmented by software control algorithms. The result is minimization of vehicle on-board complexity as ORNL and partners pursue the long-range goal of connected vehicles, wireless communications and in-motion charging. While the team's initial focus has been static, or motionless, wireless charging, the researchers also evaluated and demonstrated the system's dynamic charging capabilities. Energy Efficiency and Renewable Energy's Vehicle Technologies Office provided funding for this competitively-selected project as part of a broad portfolio in support of DOE's EV Everywhere Grand Challenge, which aims to make plug-in electric vehicles as affordable to own and operate as today's gasoline-powered vehicles by 2022. "Wireless power transfer is a paradigm shift in electric vehicle charging that offers the consumer an autonomous, safe, efficient and convenient option to plug-in charging," said David Smith, vehicle systems program manager. "The technology demonstrated today is a stepping stone toward electrified roadways where vehicles could charge on the go." Other members of the ORNL project team are current staff members Steven Campbell, Paul Chambon, Omer Onar, Burak Ozpineci, Larry Seiber, Lixin Tang, Cliff White and Randy Wiles as well as retired staff members Curt Ayers, Chester Coomer and John Miller. 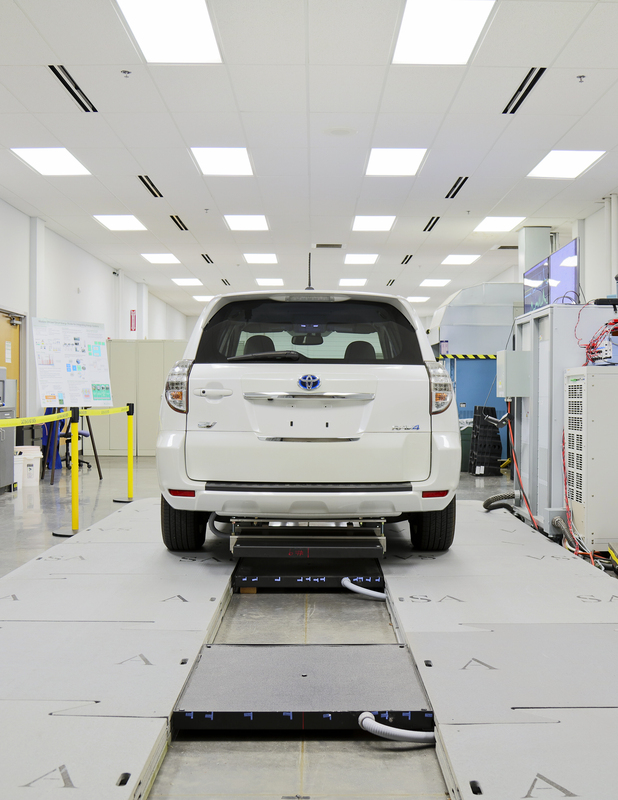 The research and demonstration took place at ORNL's National Transportation Research Center, a DOE User Facility. Cutline: Oak Ridge National Laboratory's 20-kilowatt wireless charging system features 90 percent efficiency. High performing lithium-ion batteries are a key component of laptops, smart phones, and electric vehicles. The energy-storage goal of a polymer dielectric material with high energy density, high power density and excellent charge-discharge efficiency for electric and hybrid vehicle use has been achieved by a team of Penn State materials scientists. As the world moves closer to autonomous and self-driving vehicles, road safety experts are turning from technology to psychology to better understand the road to safer mobility, according Professor Narelle Haworth, director of QUT's Centre for Accident Research & Road Safety -- Queensland. Georgia Tech researchers have a created racing, sliding, and jumping one-fifth-scale, fully autonomous auto-rally cars that runs at the equivalent of 90 mph. The ECV project has contributed in creating domestic products and markets for electric commercial vehicles in the whole value chain from components to systems.